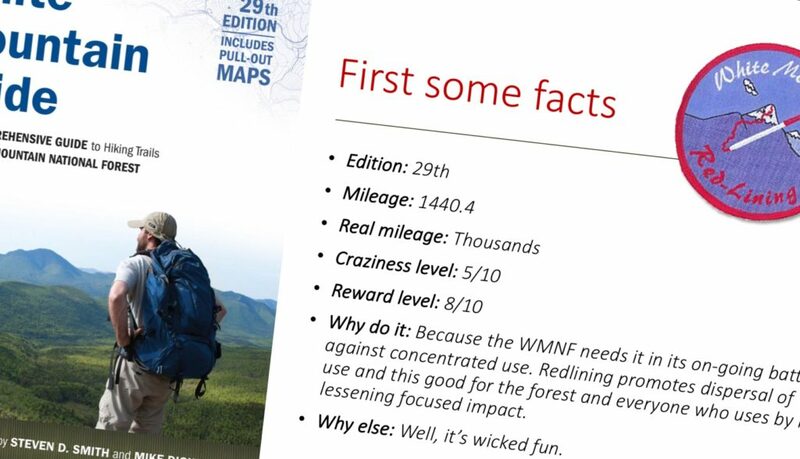 Up and coming this summer we are giving a number of presentations about “Redlining the White Mountains.” For those that don’t know, “redlining” means to hike all the trails discussed in the Appalachian Mountain Club‘s White Mountain Guidebook. Two of our Redline Guides have done this: Bill Robichaud (the 29th finisher, ever), and Mike Cherim (the 37th). Other team members are working on it at this time. Based on the 29th edition of this guide — which is the one they used — it’s 1440.4 miles of trails. There’s even more in the 30th edition. But it’s really so much more mileage considering that even your basic out-and-back trail must be traversed twice: out, and back. You can read more about this, prolonged adventure here. Or you can hear Mike Cherim tell you about it in his own words during one of these up-and-coming “Redlining the White Mountains” presentations. This, by the way, is the same presentation he gave at the 2018 AMC Annual Summit. If you missed it. Here’s your chance. Because you love this stuff. These are free events and will be held after dinner at the Pinkham Notch Visitor Center/Joe Dodge Lodge (361 NH-16, Jackson, NH 03846) on the dates listed (see inset). Presentations will begin at 8:00 PM and run until around 8:45 or so. To stay abreast of changes, learn about new dates (if available), etc., please follow us on Facebook as that’s where the individual dates will be announced as they approach and where you may optionally RSVP if you wish to let us know you’re coming. Look for these presentations and more under our “Events” tab. We hope to see you there!